After a decade sampling the wilderness of the western US and Canada, it's time to offer my list of America's best day hikes. It's a mixed bag. Over the years my tastes in hiking have shifted, from the first-timer's awe at seeing the Grand Canyon and Zion to less heavily trafficked wilds in Alaska and the Yukon. My most memorable hikes include famous and super-crowded trails (that some might actively avoid) along with lesser known routes. All though offer spectacular glimpses of the unspoilt beauty of so many of America's parks and wildernesses. The ranking of the hikes on this page is fairly arbitrary, but number one is number one - the best day hike in North America is the trail to Berg Lake in the shadow of Mount Robson's Emperor Face. Mount Robson is the highest peak in the Canadian Rockies, and the sight of the Berg glacier flowing from the summit snowfield all the way down to the lake is itself incomparable. A great hike, though, needs to be about more than just the destination, and the Berg Lake trail stands out for being outstandingly varied and scenic for almost its entire length. Along the way you pass tranquil Kinney Lake, climb past several waterfalls (including the magnificent Emperor Falls), and traverse a beautiful high valley filled with the braided outlet stream from Berg Lake. I've done this hike in a single long day (using mountain bikes to speed progress along the first few miles), and as a backpacking trip camping at Berg Lake. Both were astoundingly fun trips. If you camp, you can then day hike on to Snowbird Pass for a second dose of truly incredible scenery. Distance: an out and back roundtrip as far as Orderville Canyon is about 4 miles. A full trip north to south is 16 miles and requires a permit. 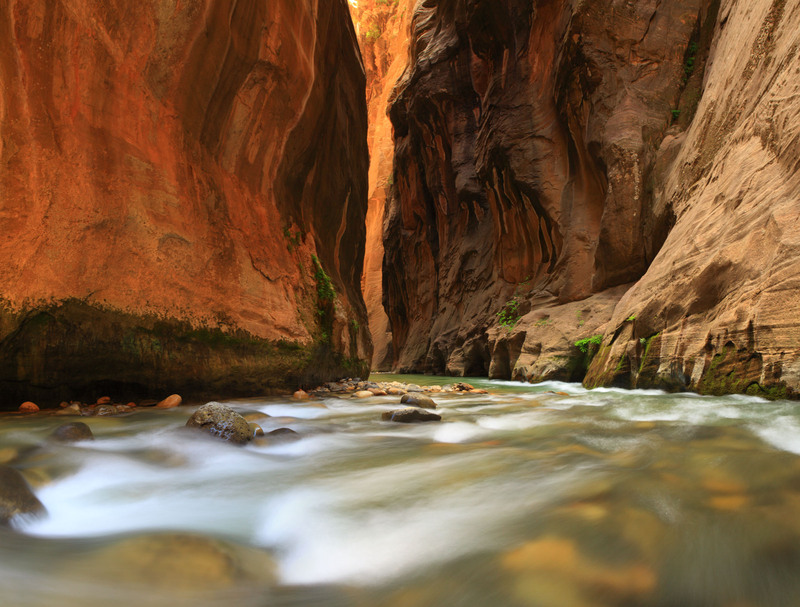 Video: Hiking the Zion Narrows, shot during my 2010 visit. Upstream of Zion Canyon in Zion National Park the Virgin River flows for several miles through the Zion Narrrows, a narrow gorge that in places is no more than thirty feet wide but perhaps a thousand feet deep. There are many narrow canyons in the Southwest (including the incredible Paria Canyon / Buckskin Gulch, which is not too far away) but in my opinion the Narrows is the finest that can be explored without technical equipment. The narrowest sections, where the river fills the gorge completely, are an incredible sight, and are close enough to the Temple of Sinawava trailhead to be easily accessible on an out and back hike. The hike is enormously entertaining - there's no real trail and for most of the way you progress upstream by wading from sandbank to sandbank in knee to thigh deep water. A wading staff comes in very handy. To see the best of the Narrows you need to make it at least as far as the junction of Orderville Canyon, which joins the Narrows near the start of a magnificent stretch that extends all the way up to Big Spring. The only downside of this hike is that it's dependent on good weather - you don't want to venture into the Narrows if the forecast danger from flash floods (updated daily and available in the Park) is anything but "low". In the event that the Narrows is out of bounds, though, there are other excellent hikes in Zion, including the airy route to Angels Landing which has a claim to being in the top ten itself. Glacier National Park, adjoining the Canadian border in northern Montana, boasts breathtaking glacial scenery, an extensive trail system, and exceptional opportunities to see wildlife including grizzly bears, which are often easier to see here than in the Canadian Rockies or Alaska. My recommended day hike in the park follows the Highline trail from Logan Pass along the base of the Garden Wall. After about 7 miles of moderate hiking, featuring non-stop views out to the peaks in the western half of the park, the trail reaches a junction with the Grinnell Glacier Overlook trail. From the junction, it's a viciously steep climb of a thousand feet in less than a mile to a notch in the Garden Wall overlooking Upper Grinnell Lake and the Grinnell Glacier. It's worth the effort - the panorama here is as spectacular as any you'll find accessible by trail in a US National Park. Returning to the Highline from the overlook, it's possible to either backtrack to Logan Pass (15 miles in all, this is what we did), continue on toward Granite Chalet and descend to The Loop further West along the Going-to-the-Sun road (13 miles), or cross Swiftcurrent Pass and descend into the Many Glacier area emerging at the Swiftcurrent Motor Lodge (17 miles). A hiker shuttle in the park makes the one-way options feasible. When: summer. Snow on the Paintbrush Divide, which doesn't melt out till August, is the limiting factor in this hike. An exceptional loop hike amid some of the most spectacular mountain scenery in the lower 48 states, the Paintbrush Canyon / Cascade Canyon loop gets an upgrade to #4 on this list after I hiked it a second time in Fall 2014. It was just as much fun a second time as the first! Starting from the String Lake trailhead it's more scenic to hike the loop counter-clockwise, starting with the ascent through Paintbrush Canyon to almost 11,000 feet at the Paintbrush Divide. These first 8 miles are stiff work, but once you reach the Divide the rest of the day is mostly downhill with the jagged peaks of the Tetons a continual backdrop. The trail passes Lake Solitude and Hidden Falls, both of which are attractive destinations, and the short side trip to Inspiration Point overloking Jenny Lake is also worthwhile. It's possible to cut a couple of miles off the total by riding the boat back across Jenny Lake, or you can walk the last section of the trail around the northern shore of the lake back to the trailhead. One of the shortest hikes in this list is also the most remote, and part of the enjoyment of hiking in the Bugaboos is the lack of crowds (this is a famous climbing destination, but few hikers seem to make the short drive over from the Rockies into the Purcells). The trail to the Conrad Kain hut is short but steep, and in places the route is protected by cables bolted into the rock. There's even one spot where you climb a steep section with the aid of a metal ladder, but the trail is in excellent shape and at least in dry weather these aids are more for reassurance than for necessity. 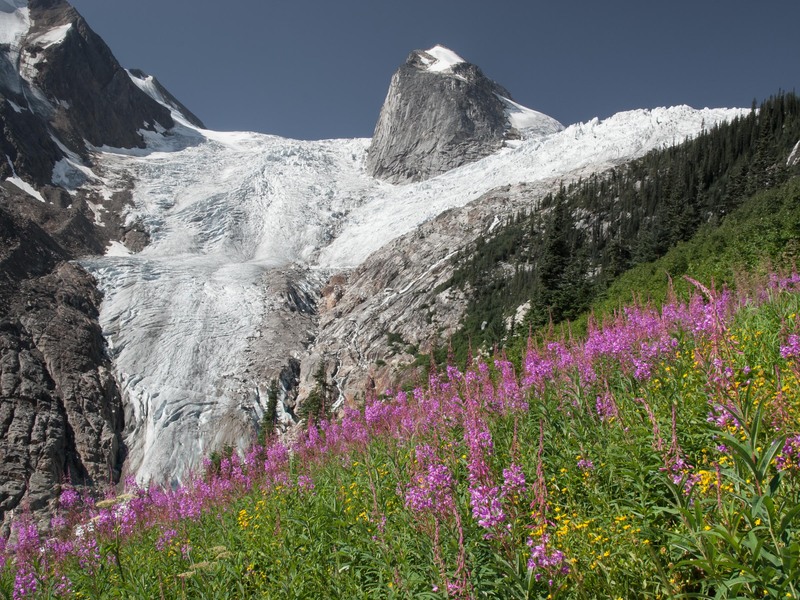 The views of the Hound's Tooth, with the Bugaboo glacier flowing past the spire and down the valley, are continual and astounding throughout the hike, and is season there are nice patches of wildflowers in several small meadows along the trail. Coyote Gulch in the Escalante is one of the most impressive canyons in the Southwest. The sinuous sandstone canyon features spectacular rock arches, deeply undercut alcoves, and lush vegetation. It's an unforgettable sight, and far enough off the beaten (and paved) track as to be only moderately trafficked. Out of several approaches the easiest (which I followed) is via Hurricane Wash, in which case you have about 5 miles of pleasant but unremarkable hiking before the real drama of Coyote Gulch begins. On a day hike it's straightforward to make it as far as Jacob Hamblin arch, which is also a good place to camp if you're backpacking (don't expect to be alone though). With the right skills it's also possible to make a loop from the Forty Mile Ridge trailhead by first heading to the lower Gulch, then hiking upstream and exiting the canyon near Jacob Hamblin Arch. The climb out of the canyon, however, is exposed and borderline dangerous without climbing skills. Whatever option you choose, the canyon is a must-see destination and highly recommended. Trailhead: Crow Pass trailhead, about 45 miles from Anchorage. From Exit 90 on the Seward highway, head north 2 miles, then turn left onto Crow Creek road. Fork right after the bridge about 5 miles in to reach the parking area. The historic Crow Pass trail features spectacular and varied scenery whose highlight is the Raven Glacier, which, although not enormous by Alaskan standards, has a wild backcountry setting. The Crow Pass trailhead is already at moderate elevation, and in no time one clears the trees and emerges onto the slopes of the Crow Creek valley. From there, it's a basically straight route up the valley to reach the pass at its head. There are a couple of different trails, a lower route that passes some old mining detritus and a small waterfall, and a slightly easier route that cuts higher along the east side of the valley. The junctions are easy to miss, but as long as the creek above the waterfall is easy to cross (as it was for us, doing the trail in mid-July) it doesn't really matter which route you take. Reaching Crystal Lake at the head of the valley, the climbing is over, and the trail continues gently over the pass to reach the Raven Glacier and a view down along Raven Creek toward the Eagle River valley. Although it's not in a National Park, the trail is well-maintained, and in season (mid-June to September, depending on the extent of winter snows) this is a popular, moderate day hike that's one of the best in the Anchorage area. Trailhead: Rubble Creek parking lot, 33km north of Squamish (or 25km south of Whistler) on Highway 99. There's a fee for parking (cards are accepted). When: summer. Expect to cross some small snowfields on the final climb to the ridge early in the season. Garibaldi Provincial Park, just a short drive north of Vancouver, is home to by far the most accessible sliver of British Columbia's mighty Coast Mountains. The trail to the Panorama Ridge - the best hike in the park - is long and, especially near the start, steep, with a total elevation gain of some 5,000 feet. In truth the first few miles, as you climb relentlessly upward through the forest, might be described as drudgery. These travails are soon forgotten, however, once the trail clears the trees at Taylor Meadows. From here on the exertion starts to pay off as views of snowy peaks emerge and the trail traverses (in late July) some of the richest wildflower meadows I've ever seen. A final steep ascent brings you to the Panorama Ridge, and a truly breathtaking vista. Mount Garibaldi, the Tantalus Range, and the Black Tusk frame the intense blue of Garibaldi Lake to form a 360 degree portrait of what looks like boundless wilderness. This is a spot to savor, so be sure to bring protection against bugs or you might need to beat a hasty retreat - the one downside of the Coast Mountains is the presence of dense swarms of black flies, which will envelope you the moment you pause to rest or eat lunch! When: summer. Even then, expect to traverse a snowfield to read the Gap. In my book Mount Rainier is the most impressive peak you can see in America without crossing the border or venturing to Alaska, and you can hardly go wrong with any of the hikes that keep The Mountain in view. The trails out of Paradise are, however, very busy, so for a somewhat more wilderness experience I'd recommend starting from the Sunrise entrance on the east side of the park. 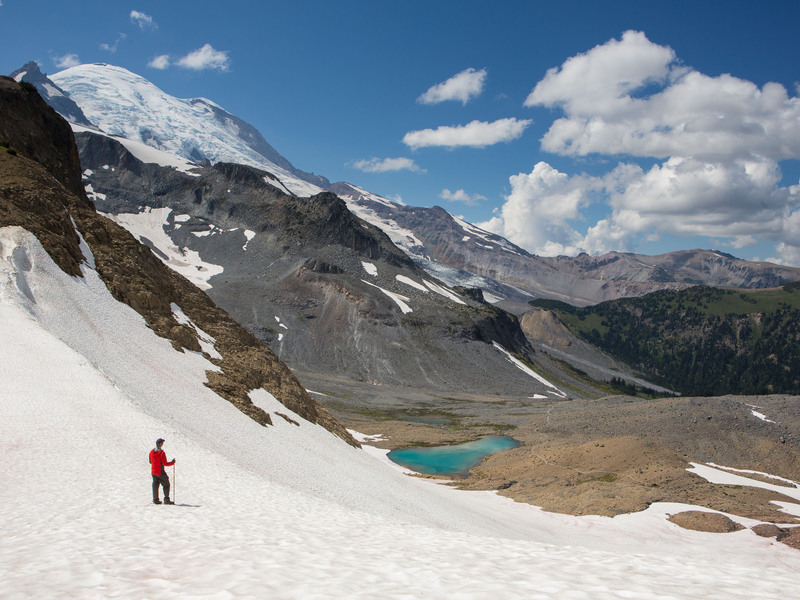 Starting from the valley, you can hike the famous Wonderland trail (which circumnavigates Rainier in a 93 mile loop) up to its high point at the Panhandle Gap. The first hour or so is steep and not too special, but this early effort is amply rewarded thereafter by a succession of astounding vistas: wildflower meadows at Summerland, icy cold lakes, and expansive views of the glaciers on Rainier as you climb to the Gap. This is a day hike that really tempts you to backpack the whole Wonderland trail around Rainier! When: May through to the first snowfall in the Fall. Best early in the season when Yosemite's waterfalls are at their peak. Almost of the trails in Yosemite offer exceptional views, but they're also typically crowded and during busy periods of the year the scrum down in the Valley is frankly best avoided. Instead of one of the routes starting on the Valley floor I'd recommend the Panorama trail, much of which is surprisingly lightly frequented. The hike starts at Glacier Point - which itself affords one of the best drive-up panoramas to be found in America's National Park - and stays high for about four miles as it traverses the edge of the Valley, passing along the way Illilouette Falls. There are great views of Half Dome, Liberty Cap and the Valley Falls for almost all of this stretch. Approaching the top of Nevada Falls you can either take the scenic but very wet Mist trail down to the Valley, passing both Nevada and Vernal Falls, or the slightly less scenic but drier John Muir trail. At the peak of the Spring runoff both waterfalls are spectacular sights. I did this hike as a partial loop from Glacier Point - descending via the John Muir trail and coming back via the Mist trail - which made for a strenuous but unforgettable 16 mile day. In the summer, though, you can also catch a bus from the Valley floor up to Glacier Point, in which case the 8.5 mile hike down to the Valley is almost all downhill. There's no dispute that the hike to Grizzly Lake is the best trail in the Yukon's Tombstone Territorial Park - it's the only trail in the park - and it's also one of the most memorable I've done. Here you're in true wilderness; the unpaved Dempster highway, which runs for hundreds of kilometers across the Arctic Circle, starts a day's drive north of Whitehorse. The nearest community is Dawson City, once the hub of the Klondike gold rush and well worth visiting for historical as well as hiking reasons. Vegetation is sparse this far north, and the Grizzly Lake trail climbs quickly out of the trees and brush to reach the Monolith Lookout with open views of the granite spires of the Tombstones. From there it's a strenuous but basically straightforward route along the high slopes of the valley all the way until the trail drops down to Grizzly Lake in the shadow of the peaks. You could hike out and back to the lake in a day (summer days are very long at this latitude), but having come this far it makes more sense to savor the experience and camp. That's what we did, and my only regret is not having had more time to press on to Divide Lake and see more of this wonderful range. Are these really the ten best hikes in America? Of course not! Quite apart from the fact that there are eleven, this list is a subjective ranking of trails that I've personally hiked, and I certainly hope that I haven't exhausted the best that North America has to offer yet. Hikes I know about (but haven't done) that might one day make this list include Half Dome in Yosemite, the Sahale Arm in the North Cascades, and hikes out of Kennicott in Wrangell-St Elias National park. Surely there are many more I don't know about. Finally my own personal bias is toward full day hikes that leave you exhausted but with a real sense of accomplishment at the end of the day. If the metric were instead maximum scenic reward for minimum effort the list would look very different, with the Eielson ridge trail in Denali National Park, the Delicate Arch trail in Arches, and the Parker Ridge trail in Banff being hard to beat. Still, whether or not these are the best trails out there I can almost guarantee that none of the hikes above will disappoint. Enjoy! Disclaimer: these are all non-technical hikes, mostly on excellent trails in National Parks. Still, the number of ways in which people can come to grief in the outdoors is almost limitless, and both mountains and narrow canyons pose their share of dangers. Conditions change from season to season (and sometimes from hour to hour), so don't rely on my word and take all due care. I'd particularly note that many of these are pretty long and strenuous hikes that might work better as short backpacks than day hikes for some folks.